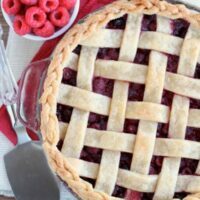 Lattice Pie Crust Tutorial - Dessert Now, Dinner Later! 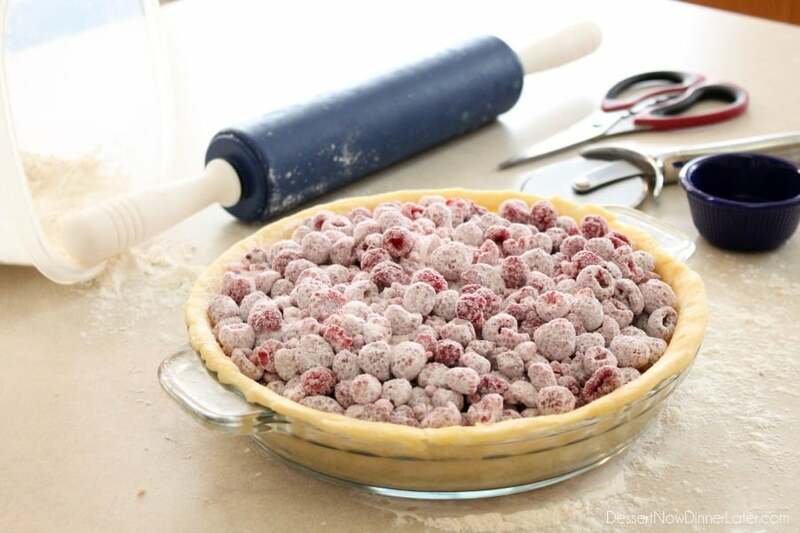 Start with your favorite pie crust recipe. 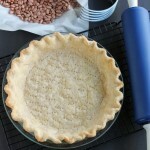 Here’s my perfect pie crust recipe and tutorial. Make sure that it makes enough for a top and bottom crust. 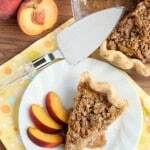 Divide the pie dough in half, roll one half out, fit it in your pie dish, and cut off the excess crust around the edges. 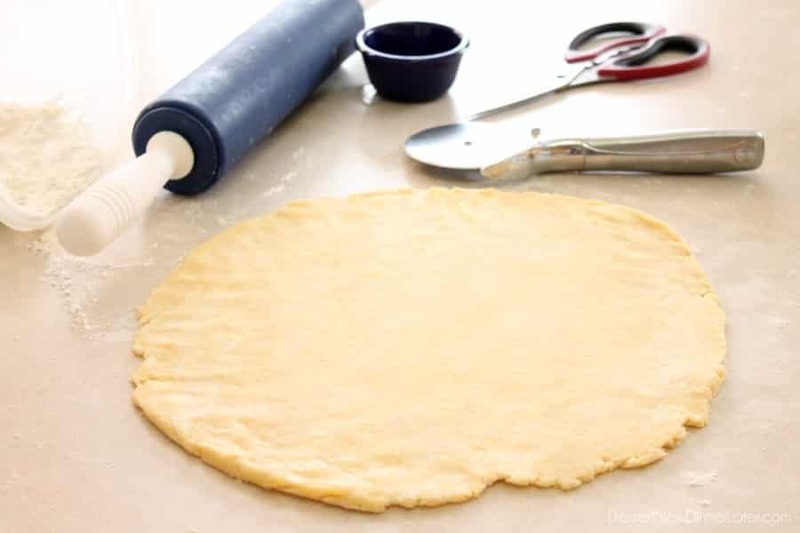 Roll out the other half of the pie crust into a circle about 1/4-inch thick. With a pizza cutter, cut 1-inch wide strips – you will need at least 10, but save any extra crust for a braided edge. Criss-cross two of the pie crust strips over the center of the pie. Place the first strip vertically (up and down), the second strip horizontally (left to right). 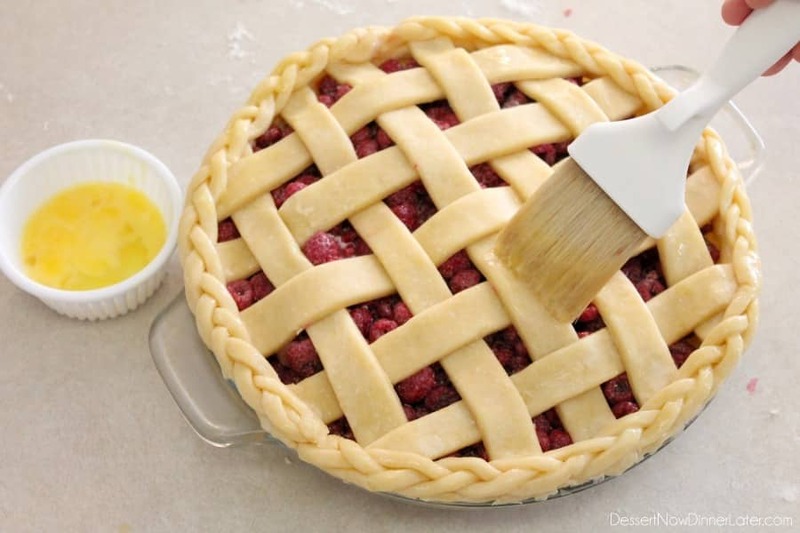 Use the center pie crust strips because they are the longest. Place two more strips vertically on top of the horizontal strip. Take two more strips and horizontally weave them over, under, and over the vertical pie crust strips. Grab two more strips and weave them vertically over, under, and over the horizontal pieces. Grab two more strips and weave them horizontally over, under, over, under, and over the vertical pieces. Fill a small cup with water. 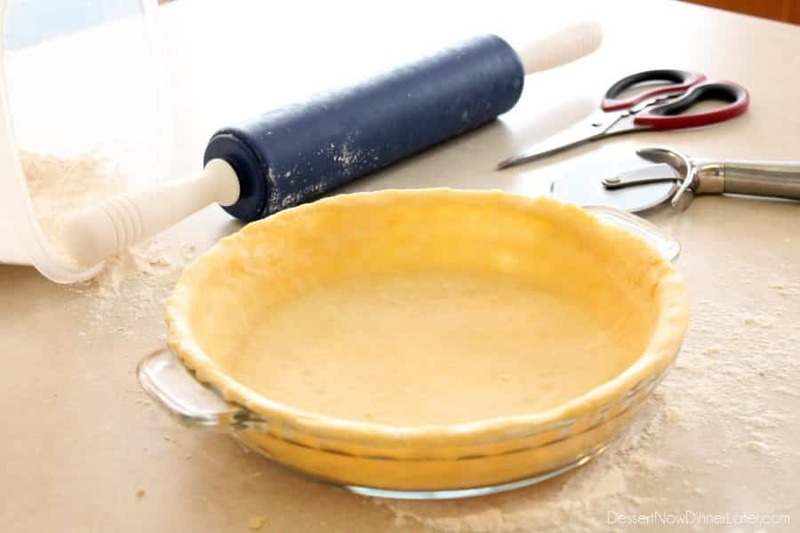 Wet your fingers, and dab the edge of the bottom pie crust all the way around. 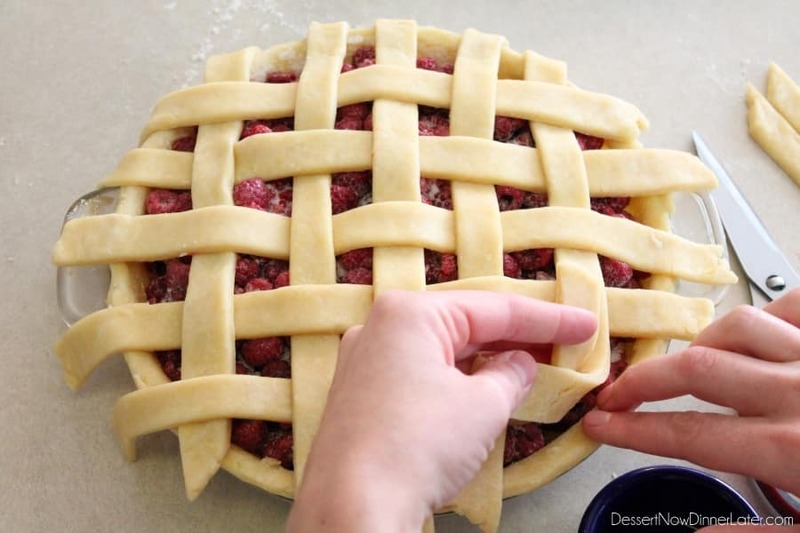 Press the lattice pieces into watered edge of the bottom crust and cut off the ends of the strips. 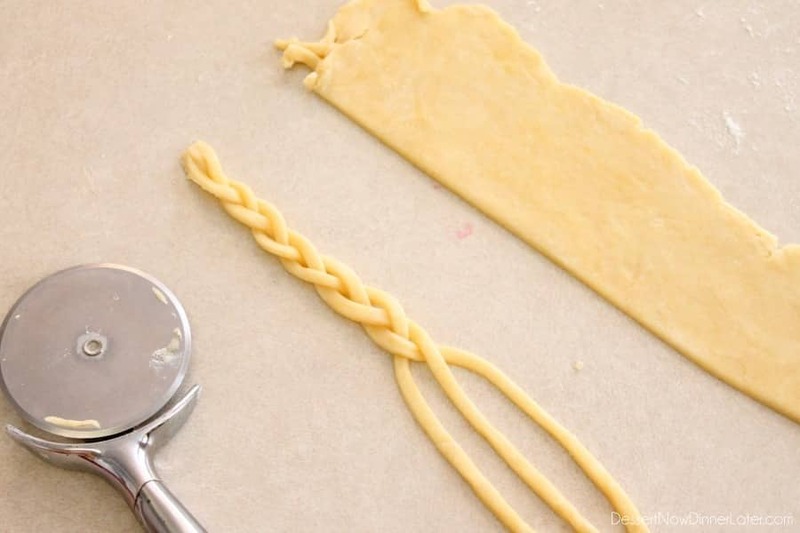 If you have extra pie crust, you can make a braided edge. 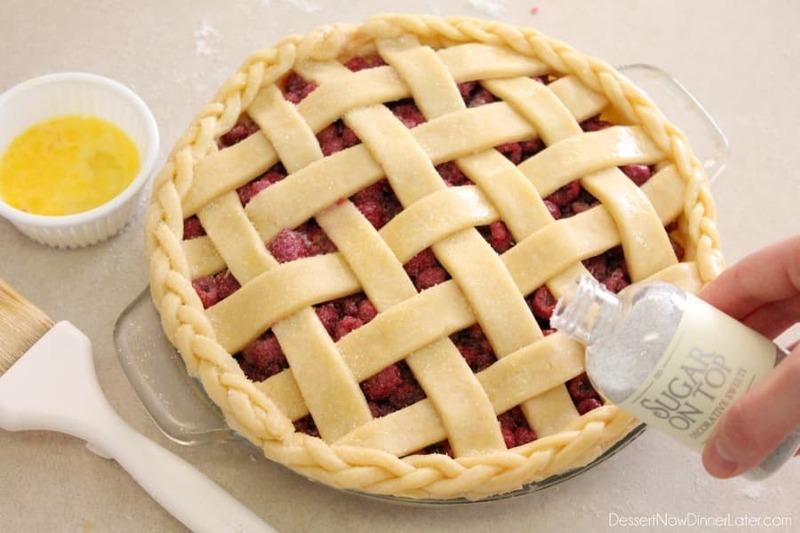 Cut 1/4-inch strips and braid the pie crust on the counter. You basically alternate bringing the outer strips in towards the center. 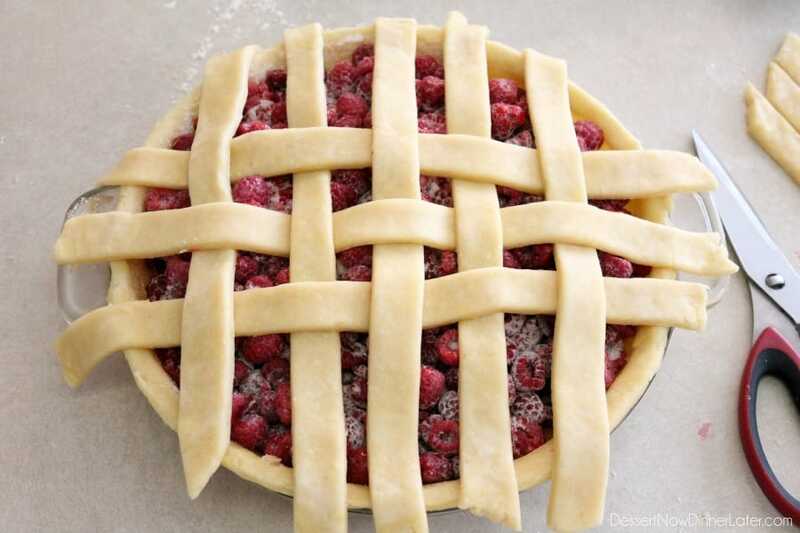 It took 3 braids to cover the whole edge of the pie crust pictured here. Dab water along the edges and gently press the braids in place so they will cook together and stay in place. Whisk an egg and brush the crust gently. This helps it brown up as it bakes. 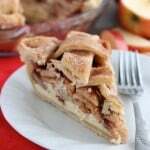 Depending on the flavor of pie, you can sprinkle sugar or cinnamon-sugar on top for added sweetness and sparkle. Bake at 350 degrees Fahrenheit for 60 to 75 minutes or until crust is golden and the filling is bubbling in the center of the pie! 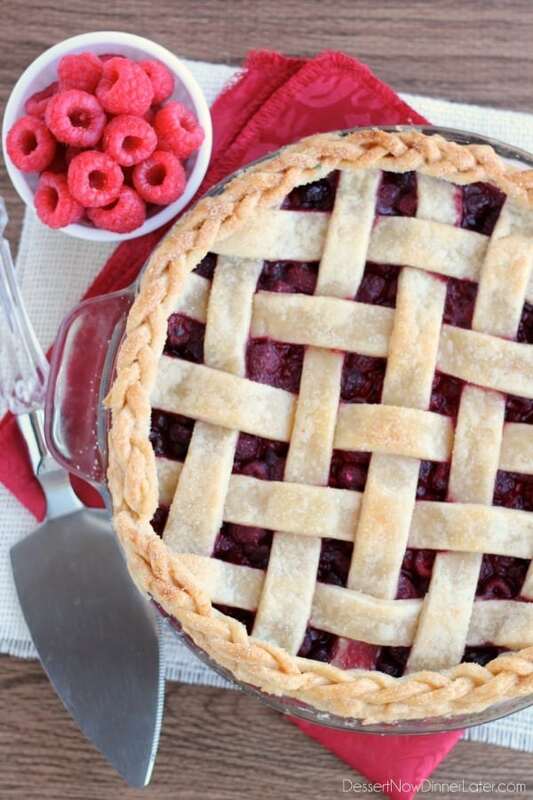 Start with your favorite pie crust recipe. I used my perfect pie crust recipe. Make sure that it makes enough for a top and bottom crust. Fill your crust with the filling of your choice. 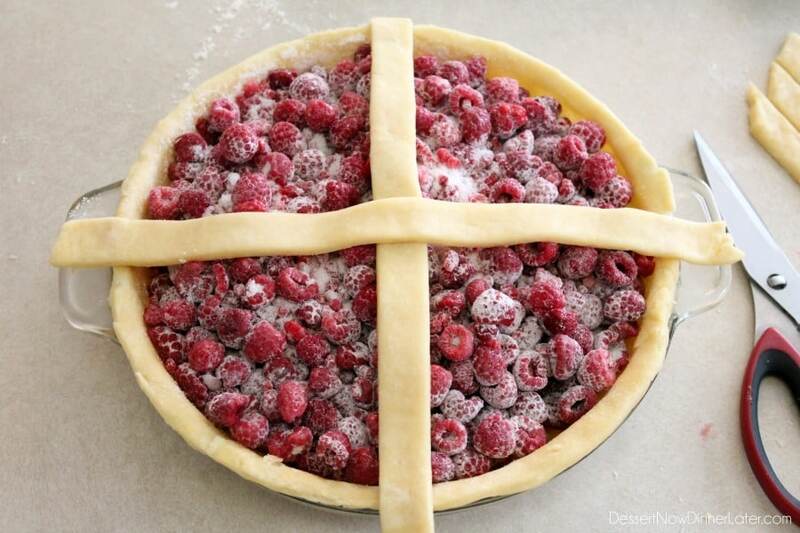 Roll out the other half of the pie crust into a circle about ¼-inch thick. 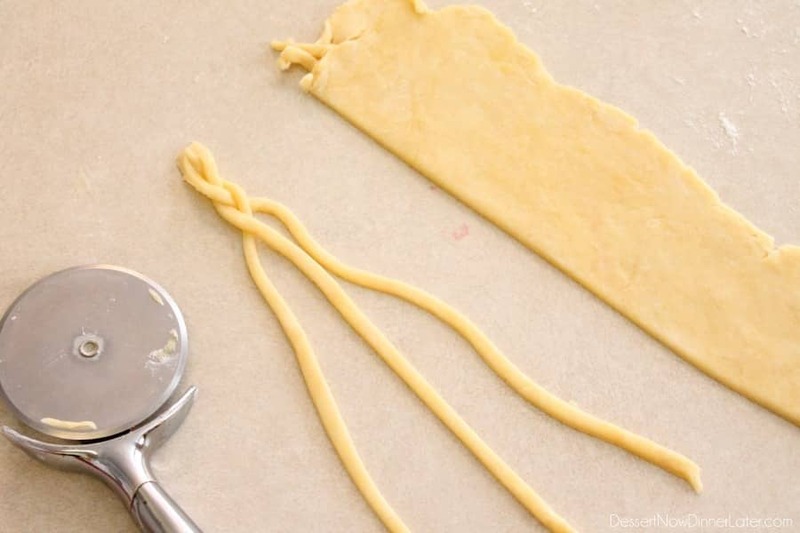 If you have extra pie crust, you can make a braided edge. 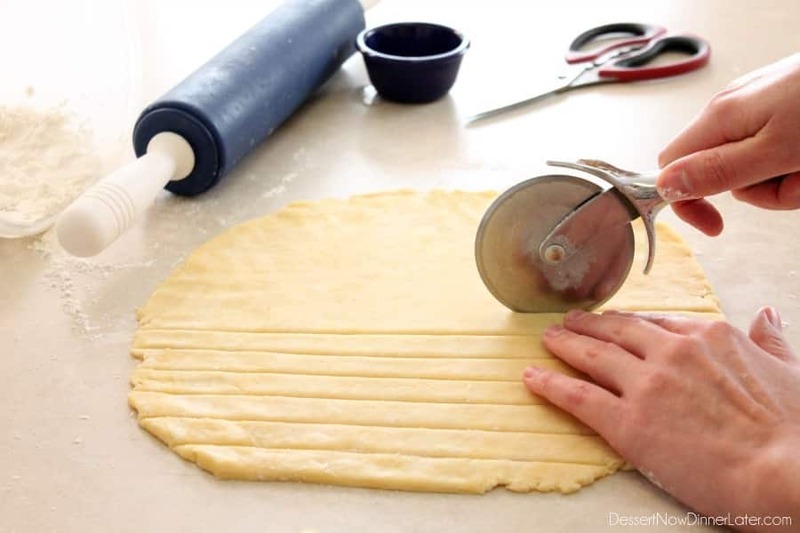 Cut ¼-inch strips and braid the pie crust on the counter. You basically alternate bringing the outer strips in towards the center. It took 3 braids to cover the whole edge of my pie crust. Dab water along the edges and gently press the braids in place so they will cook together and stay in place. Thanks Tina….seriously, any pie! I’m a sucker for berries or apples! Just have fun with it! Thanks for the easy tutorial, Amber. 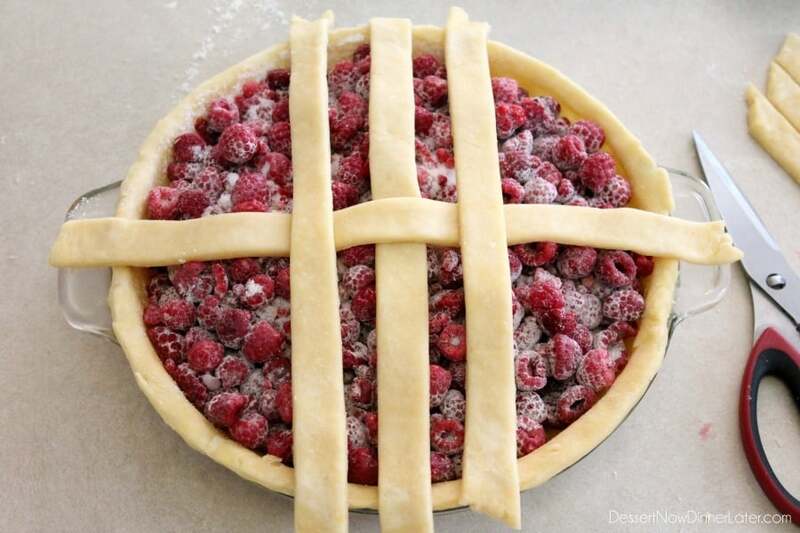 I’ve never made a lattice top pie but looking forward to trying it. 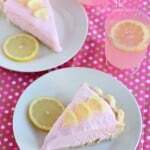 This pie is absolutely gorgeous! And raspberry is my favorite. Can’t wait till tomorrow! Thanks Mallory! I too love raspberries! 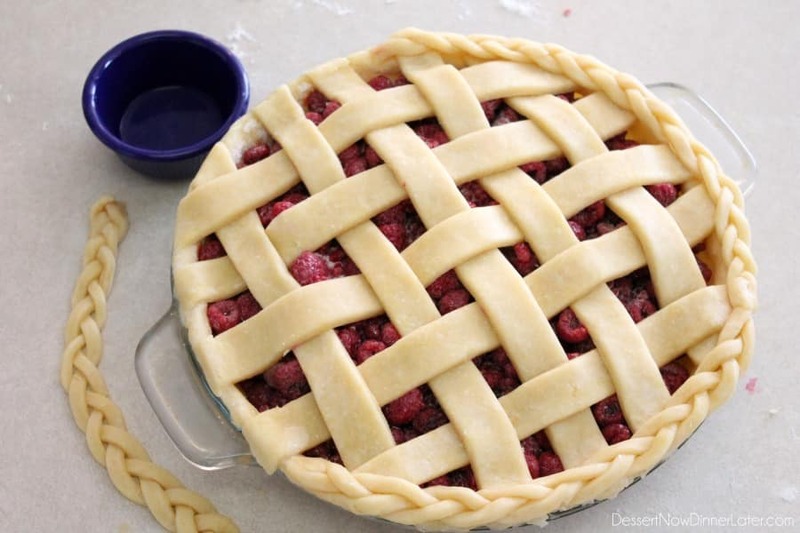 Gorgeous gorgeous pie! 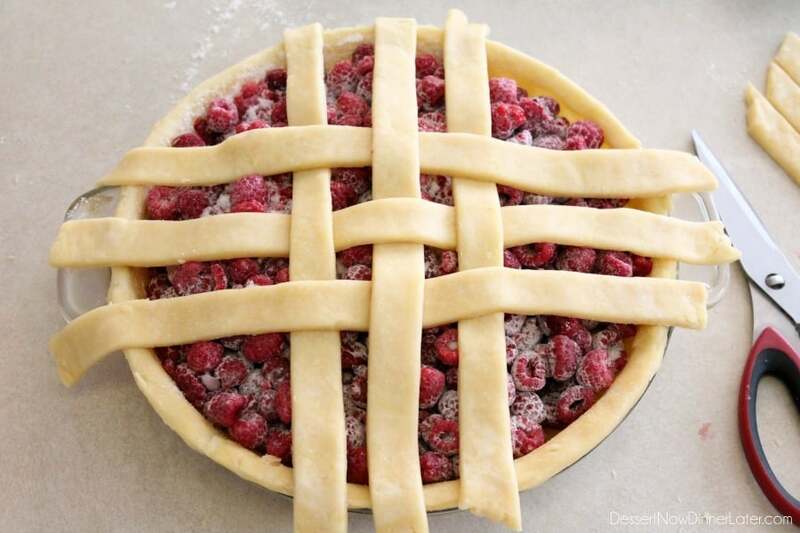 The lattice crust looks perfect! 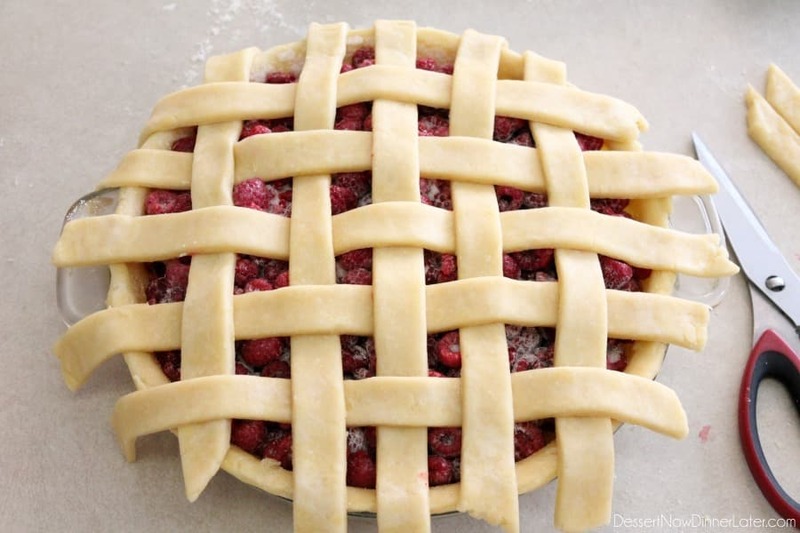 Every time I try to make a lattice crust, I always fail miserably so I am super excited to try this again with your amazing tutorial 🙂 Can’t wait to see the raspberry filling recipe tomorrow too! I was wondering if you would notice! Haha. It was fun to use! Oh my gosh, Amber! 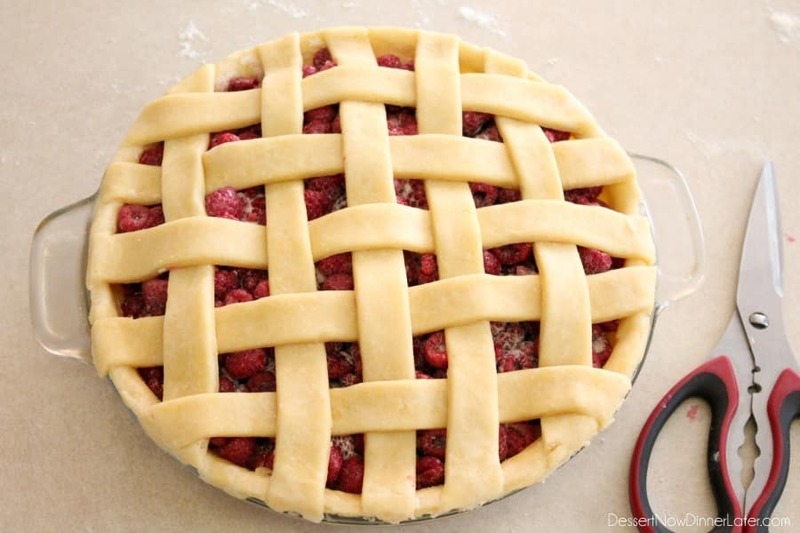 This has got to be the most gorgeous lattice crust I’ve ever seen! You make it look SO easy too! Absolutely gorgeous step-by-step photos and I’m definitely gonna refer back to this when I make my pies for Thanksgiving! Thanks Sarah! I seriously love playing with pie crust! I hope the tutorial helps!